Summary: America has the greatest military force on Earth, a terrible swift sword. We face hard times, perhaps for a few years. Perhaps for longer. Will we yield to the temptation to use our power to steal from other nations? What would our forefathers think of such a decision?How will America react to hard times? The Great Depression is long ago, and we have changed since then. The 1970’s were not so bad as the 1930’s, and are much closer to us. What solutions ran through our minds back then? “The United States government seriously contemplated using military force to seize oil fields in the Middle East during the Arab oil embargo 30 years ago, according to a declassified British government document made public on Thursday. 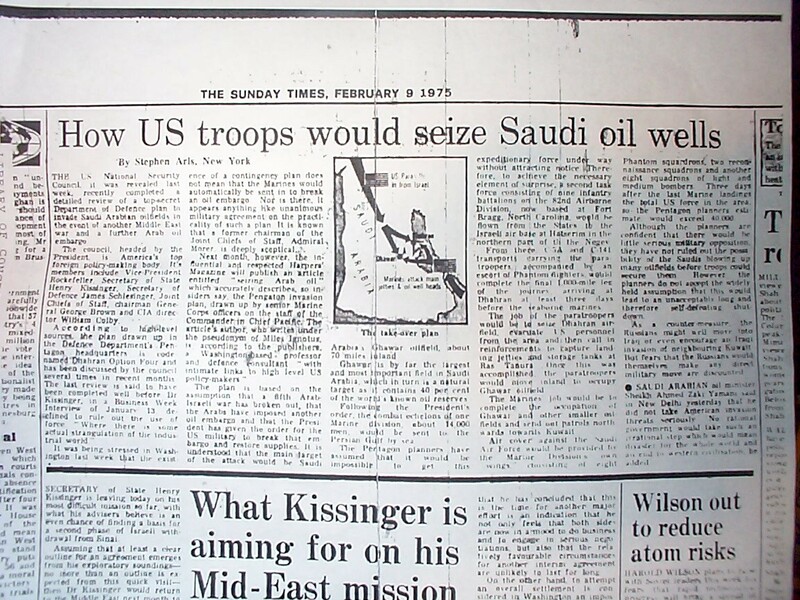 “How US troops would seize Saudi Wells”, Sunday Times (UK), 9 February 1975 — Leaked details about a US DoD plan code-named “Dhahran Option Four” to seize the Saudi oil fields. See this photo of the page. We spend almost as much on national security (broadly defined) as the rest of the world combined, and many times that of any conceivable combination of enemies. While that suggests considerable paranoia in the American character, it also creates the temptation to use that power. We have lived beyond our means for many years now, borrowing from other nations. Now the bills comes due. Power shifts to the new Asian manufacturing nations and the oil-rich nations of the Middle East. We can compete – trim down and work harder. Buckle our belts tighter and pay our debts. Or we can use our guns to steal. To make it easier for our conscience, we could demonize “those dirty uncivilized terrorist-loving Arab Islamic people with their evil God.” Its has been done before. Sometimes successfully. Also — Middle Eastern oil is not the only potential target. Force can gain wealth in many ways, some overt — some subtle. Generally the officers of the army were indifferent whether the annexation [of Texas] was consummated or not; but not so all of them. For myself, I was bitterly opposed to the measure, and to this day regard the war [with Mexico] that resulted as one of the most unjust ever waged by a stronger against a weaker nation. It was an instance of a republic following the bad example of European monarchies, in not considering justice in their desire to acquire additional territory. Texas was originally a state belonging to the republic of Mexico. … it had but a very sparse population, until settled by Americans who had received authority from Mexico to colonize. These colonists paid very little attention to the supreme government, and introduced slavery into the state almost from the start, though the constitution of Mexico did not, nor does it now, sanction that institution. Soon they set up an independent government of their own … [and] offered themselves and the State to the United States, and in 1845 their offer was accepted. The occupation, separation and annexation were, from the inception of the movement to its final consummation, a conspiracy to acquire territory out of which slave states might be formed for the American Union. Even if the annexation itself could be justified, the manner in which the subsequent war was forced upon Mexico cannot … the Southern rebellion was largely the outgrowth of the Mexican war. Nations, like individuals, are punished for their transgressions. We got our punishment in the most sanguinary and expensive war of modern times. There comes a time in the life of each man when he must make a decision. Grant Kimbrough had one to make now: behind him on the sand was a fortune. Behind him was a girl he wanted, but whether he got her or not, the gold was there. And all that stood in his way was the load carried by his six-shooter. It was murder, but he had killed before this. What of the men who died during the war, and those Indians who died here? Suppose, just suppose nobody was left alive but himself? It could easily happen. And if only one was left, well, who was to say how the others died? He stared bleakly at the sand. He had come a long way since the old days. He shied away form the memory of his father. He could see the old man now. If his father had ever believed his son capable of what he now considered, his father would have killed him himself. Yet his father had never been in such a position: all that lay between himself and a bleak future was a few pistol bullets.